Join us on Mondays at 10:00 am in room UL6 on the upper level of the church. Our “Prayer Shawl” knitting ministry began in the Summer of 2006. Since then, we have created more than 50 shawls that have been dedicated and presented to people in need of comfort. We also created nine “Linus’s Blankets” that we sent to Greensboro, North Carolina and fifteen baby blankets that we sent to Haiti. In 2007, four North Christian Church members traveled to Machakos, Kenya to help construct a church building for the Katisaa African Inland Church. During that mission trip, a participant in the Knitting the Mystery fellowship noticed some of the church women knitting. On a return trip two years later, a Knitting Fellowship was nurtured by the AIC Katisaa women. 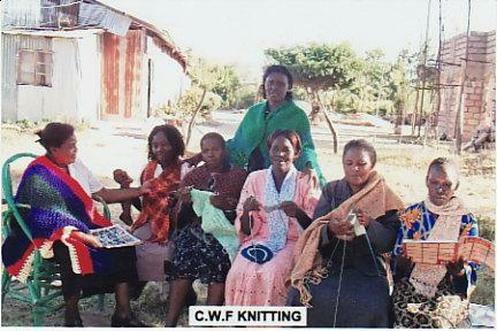 The picture to the left shows several of the women knitting shawls.